Some married people purchase real estate in New Mexico for vacation or investment purposes and title it as the sole and separate property of one spouse. Others identify themselves as husband and wife, but do not specify how they wish to hold title. In many such situations, the death of one spouse initiates a case with the probate court to distribute the decedent's estate according to his/her will. This judicial proceeding might also include transferring ownership of real estate into the living spouse's name. But what if the deceased spouse died intestate (without a will) or has arranged for all of his/her assets to pass to named beneficiaries using non-probate options such as joint ownership, transfer on death designations, or trusts? If the house qualifies as a <b>homestead</b> and is vested as <b>community property</b>, the remaining spouse might be able to gain full title rights more easily by using a transfer of homestead affidavit. 1. The decedent and the surviving spouse owned New Mexico real estate identified as a homestead. 2. The decedent and the surviving spouse held title to that real estate as community property (See Section 45-2-102. 3. No probate proceeding is required for any other property or assets. 4. All taxes and obligations due from the estate have been settled. 5. The full value of the property as assessed for property taxation purposes does not exceed five hundred thousand dollars ($500,000). 6. At least six months have passed since the deceased spouse's death. To complete the transfer, the surviving spouse must record the completed, notarized document at the clerk's office for the county where the property is located. 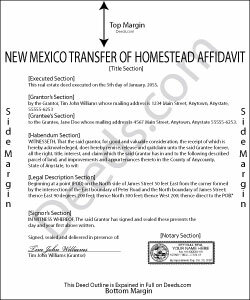 In addition to the affidavit, attach certified copies of the deed granting ownership to the married couple (including a legal description of the homestead property), the decedent's will, if any, and the death certificate. Note that some counties in New Mexico refuse to record death certificates because they might contain protected information such as social security numbers, so contact the local recording office to verify their requirements. A homestead, or family home, is the principal place of residence of the deceased or surviving spouse. It includes the house, associated buildings on the property, and enough land to support reasonable access and use. See Section 45-3-1205(C) NMSA 1978. Community property as defined in Section 40-3-8 is a vesting option that is only available to married couples. Property acquired during marriage, by either or both spouses, is assumed to be community property unless specifically identified as separate property. Deeded property acquired by the couple, whether as tenants in common or as joint tenants or otherwise, is presumed to be held as community property. This discussion is provided as general information. Please contact an attorney for assistance with specific questions or complex situations.